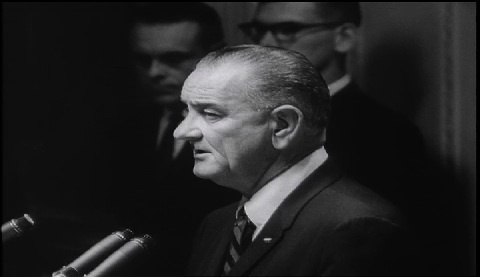 This film explores U.S. policy toward Vietnam, focusing on how the U.S. commitment expanded from providing supplies to military advisors, and ultimately combat forces in response to the growing challenge of the communists. Scenes show the bombing of the U.S. Embassy and barracks building in South Vietnam, scenes of U.S. soldiers and Marines in combat, and footage of Ho Chi Minh and the Vietcong. Other personalities shown are Secretary of State Dean Rusk and Secretary of Defense Robert McNamara. Chicago: “Vietnam: A Television History; Why Vietnam? [Part 3 of 3],” 01/01/1965, WGBH Media Library & Archives, accessed April 23, 2019, http://openvault.wgbh.org/catalog/V_E2BD01819ACE42BFB1D41C9F53FD072C. MLA: “Vietnam: A Television History; Why Vietnam? [Part 3 of 3].” 01/01/1965. WGBH Media Library & Archives. Web. April 23, 2019. <http://openvault.wgbh.org/catalog/V_E2BD01819ACE42BFB1D41C9F53FD072C>.